Art Journalism 101 Workshop Is Now Open For Registration! I am so happy to announce that my Online Art Journalism 101 Workshop is now open for registration. This will be a workshop to motivate you, share some of my favorite techniques, and get you started on the road to keeping a visual art journal. The class will be 5 weeks and starts in January. 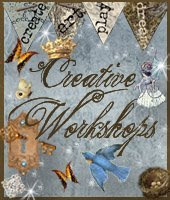 Class supply list is posted on the Creative Workshop’s site. I hope to see you there as we chase those winter blues away and cozy up by the fire to let our hair down let our muses play! Oh wow! An opportunity to learn from you. I think I’m in heaven. i signed up earlier today! i cant wait to start, i must not think that its still almost 2 months away! I had the redirect problem as well, so I e-mailed Gail. It didn’t affect my registration, so all is well.Pam, I mentioned your class in my blog. I’m so excited to be taking this class! How fun! Now if you two start passing notes, I will have to seperate you-haha! I’ve been in class with Michelle before so I know all of her tricks-lol! Glad you all are joining me on this adventure~something to look forward to after the holidays! Hi Pam, you don’t stand bad students in the corner do ya?? heheh…just kiddin! When I saw registration was ok I jumped on it so I wouldn’t miss out. I see my sister, Mary did as well…we promise to be good Pam…hehehe!! Yahoo schools in. Race everybody to the classroom. I promise Pam I will behave as I would hate to be suspended from class LOL smiles and big hugs. Michelle… you go Girl!